Burke  stated that the most common causes of tooth fracture have been identified as high impact forces caused by biting on a hard object or uncontrolled contact of opposing teeth. A classification was suggested by Talim and Gohil. They found that sudden biting on a hard object was the most common cause of fracture, with stone particles and nuts being particularly Implicated. Trope and Transted  stated that endodontically treated teeth contain less moisture and are structurally weaker, and thus fracture more easily than vital teeth, particularly in endodontically treated posterior teeth, where the stresses of occlusion can lead to the fracture of unprotected cusps. The success of an endodontic treatment depends not only on just the three-dimensional intact root canal filling but also on the ability of restored tooth to withstand the forces of occlusion. Several materials have been suggested as intracoronal restorative materials (IRM), and temporary restorative material (TERM). New Materials: (1) Glass ionomer cement; (2) composite resins; and (3) core build up materials, such as miracle mix, coremax, and Hi-Dens, which are metal reinforced glass ionomer cements. The purpose of the present study was to determine and compare the resistance to fracture of endodontically treated maxillary 1 st premolars restored with different materials in mesio-occluso-distal (MOD) cavity preparations. Healthy maxillary 1 st premolars extracted from patients of age group between 15 and 25 years for orthodontic reasons were obtained from the Department of Oral and Maxillofacial Surgery. These were stored in normal physiological saline solution until further use. All the samples were examined thoroughly with fiber optic visible light and those having pre-existing cracks and defects were discarded. One hundred teeth having a medium size of 8.5-9 mm faciolingually and 6.5-7 mm mesiodistally were selected. All the 100 samples were divided into 5 groups randomly. Out of 100 samples selected, 20 samples with intact teeth were grouped as 1. Standard ovoid coronal axis cavities were prepared in 80 samples. The preparations were done with airotor for initial enamel preparation, and the finishing of axis cavity was done with round bur and air motor. A MOD cavity preparations with parallel walls and without proximal steps is cut across the occlusal surface through the central groove with the help of a straight fissure diamond bur fitted to an airotor hand piece, the cavities were then finished with diamond bur fitted a micromotor contra angle hand piece. The preparation was made with a straight fissure bur to dimensions of 6 mm deep, 4 mm wide using a metal block as a guide. Cavities prepared were then rinsed with water and air dried. After access cavity preparation, the buccal and lingual canal orifices were identified and routine endodontic procedure was done. The canals were enlarged up to size of 30 using K files and reamers. Step back technique was used during canal preparation. Normal saline was used for irrigation during canal preparation. The canals were dried with absorbent paper points. The buccal and lingual canals were obturated with gutta percha points and zinc oxide eugenol as root canal sealer by lateral condensation technique. Group 1: Twenty teeth with prepared MOD cavity restored with a base of 2 mm Glass ionomer cement (GIC) remaining access cavity left unrestored. Group 2: All the 20 samples with prepared MOD cavity were restored with a base glass ionomer cement (Fuji 9). It was used both as base and a material to restore the access cavity. Group 3: All the 20 samples with the prepared MOD cavity were restored with a base of glass ionomer cement (Fuji 9) of 2 mm thickness over which 4 mm thickness of glass ionomer-silver alloy reinforced cement, that is XP Hi Dense of Shofu (INC Tokyo, Japan) was used as a restorative material to restore the access cavity. Group 4: Twenty samples after obturation the MOD cavity of each specimen was restored with 2 mm thickness of glass ionomer cement (Fuji 9) restored as a base and over that each cavity etched for 60 s with 37% orthophosphoric acid gel, rinsed for 30 s, with water and air dried. The enamel and dentin of the preparation were coated with a single layer of light curable bonding agent (3M) single bond. Hybrid composite (P-60) was then placed in the prepared cavity in 2 layers each of 2 mm thickness. Each layer was light cured with a high intensity fiber optic light for 60 s. After 30 min, wait, excess resin was removed to cavo-surface margin with a carbide finishing bur. All the 100 samples were mounted in a base of stone plaster with the help of a fiber ring of 1 diameter exposing only the coronal portion. After the material was set, it was wrapped in a damp gauze and stored for 24-48 h. The teeth were tested 48 h after restoration. All the 100 samples were subjected to compressive load in strong universal testing machine. The study was carried out with loading conditions simulating centric occlusal forces. Especially designed feature which had a point contact with buccal and lingual cusps was made to give this centric occlusal load. The tip of the fixture which came in contact with the tooth was half round in shape with a dimension of 7 mm diameter. The tip of the fixture was rested on the buccal and lingual cusp above the central occlusal forces such that the force was applied to the cusps only and no contact was made with the restorative material. A cross head speed of 0.1 mm/s (0.23 in/min) was used to apply the load till the teeth were fractured. The load required to fracture all the specimen was recorded in kilograms (kg) and the data obtained was subjected to statistical analysis. 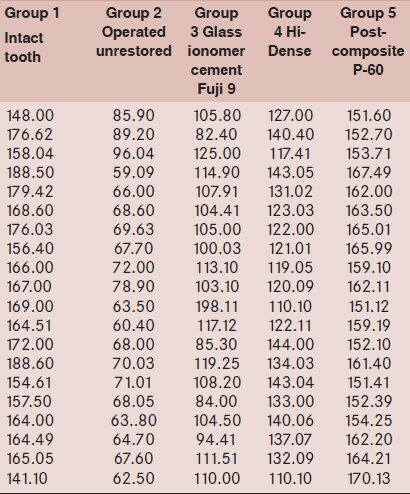 In this study, the force (in kg) required to fracture endodontically treated teeth restored with Fuji 9 GP, Hi-Dense and posterior composite P-60, as Core material was evaluated and the results were obtained as given in [Table 1], [Table 2], [Table 3] and [Table 4]. 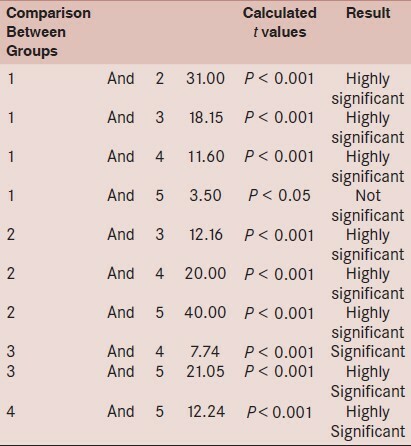 The experimental methodology used in this study resulted in large standard deviation as seen from the mean of 5 groups. This can be attributed to individual variations in morphology among the teeth, including the angulation of cuspal inclines, thickness of enamel, and inherent weakness of tooth. To compensate for these differences, the teeth were prepared in a uniform manner. Slight variations in the level of contact of the tip of the loading instrument with the cuspal inclines probably occurred producing differences in positioning of force application on the cusps. If a standardized tooth model was available, this standard deviation could have been further reduced. The data obtained was subjected to ANOVA test, and a statistically significant difference among the group was found. Student's t test was done to compare in individual groups, tables were drawn for easy reading and references. As per the statistical analysis, it is seen that teeth restored with P-60 had the maximum strengthening effect on the teeth. These findings are in collaboration with the findings of Trope et al and Reeh et al. Teeth restored with Glass ionomer Fuji 9 increased the strength compared with unrestored teeth but there was no significant strengthening effect as compared with intact teeth. This is probably attributed to the fact that there is weak bonding between the tooth surface and the restoration. Edward et al stated that the glass ionomer cements first introduced in 1972, are a hybrid of silicate and polycarboxylate cements. They offer 2 great advantages over most other materials release of fluoride and adhesion to dentin and enamel. Also Glass ionomer cements are used for a variety of purposes, including cavity lining, crown buildups, restorations, cementations of castings and also the glass ionomer-metal reinforced materials have become a viable alternative for selected crown buildups. Jyont et al stated that with the introduction of glass ionomer cement as a base material for cavity preparation, the potential exists to strengthen the remaining tooth structure by means of a chemical bond as well as mechanical interlocks. GIC is one of the few dental materials available that can bond chemically to both enamel and dentin. In addition, the surface of a set GIC can be acid etched to allow mechanical locking of a composite resin to its surface. When used in a cavity preparation of intracoronal design, GIC may provide increased resistance to cuspal fracture. Stewart  suggested the clinical application of GIC in endodontics. They concluded that because of the tissue compatibility of the GIC and their ability to bond to dentin and enamel. They can be used in the treatment of many endodontic and restorative problems. The GIC may in the future replace zinc oxide eugenol root canal cements for obturation. The resistance to fracture of endodontically treated premolars was highest when the intracoronal cavities prepared in the teeth were acid etched and filled with a composite resin. Glass ionomer cement used as a base under either a resin or an amalgam restoration increased the resistance to fracture of endodontically treated premolars, but to a lesser degree than the use of the acid etch resin technique. The characteristics, which make GIC desirable are chemical bonding to enamel and dentin, a coefficient of thermal expansion, which is essential the same as that of tooth structure. Glass ionomer did not increase the resistance to fracture of endodontically treated premolars when it was used as the sole restorative material. After obturation, the coronal base is mandatory. In this study, 2 mm thickness of glass ionomer cement Fuji 9 is used as a coronal base in groups 2-5 and in Group 3, it is used as a restoration. When compared with groups 4 and 5, it does not increase resistance to fracture of cusps. In comparison, groups 4 and 5 the fracture resistance of Group 5 (P-60) was found to be greater than Group 4 (Hi-DENSE). The use of posterior composite P-60 has resulted in bringing back the strength of the endodontically treated tooth to near normal levels of intact tooth. This strength effect was not seen with HI-DENSE. These differences in strengthening effect can be attributed to the fact that glass ionomer restorative material has been shown to have poor tensile and compressive strength. Studies done by De Gee et al have shown that although Hi-Dense contains silver alloy as filler particles it does not enhance the tensile and compressive strength of the material. Added to this, the presence of silver alloy at the tooth restorative interface does not permit complete chemical bonding to the tooth structure and there is reduction in the surface area available for different chemical bonding. Whereas study made by Jagadish and Yogesh  in which they compared, MOD cavities restored with amalgam, composite, glass cement, with unrestored and intact tooth and found that posterior composite resin has great potential as a cusp reinforced material, which have proved to be most effective in offering fracture resistance of teeth. Packable resins showed superior qualities in terms of diametral tensile strength, transverse strength, elastic modulus, and fracture toughness. Technical approach by which this was accomplished was through modification in the filler of each system, like it could be in the form of microfilamentous glass fillers in conjunction with ground barium borosilicate or an interlocking particle technology. As the restorative procedure suggests the necessity of the acid etching and the use of enamel and dentin universal bonding agent, there is an increase in surface area adhesion with the help of formation of resin tags. The presence of coupling agent Vinyl silicone on the filler particle of P-60 adds greatly to the strength of the restoration by preventing crack propagation along the matrix filler interface. The absence of coupling agent on silver particle in Hi-Dense may also be a cause for poor compressive strength as cracks could easily propagate through this interface. The fracture patterns seen in this study was entire longitudinal fracture through the crowns of tooth to splitting the tooth in 2 halves or there was fracture of cuspal tips. The tooth restored with glass ionomer Fuji 9 and Hi-Dense had longitudinal fractures in most of the cases and the failure occurred at the tooth restorative interface. The tooth restored with posterior composite P-60 fractured at an higher load which had neared that of a normal intact tooth and fracture was seen either in the buccal or lingual cusps. This difference in fracture patterns can be attributed to greater bond strength of P-60 when compared to Hi-Dense and weak bonding of glass ionomer cement. Based on this, it is apparent that the strengthening effect of the restorative material is determined by the cohesive strength of the restorative material, the bond strength of enamel and dentin universal bonding agent and total area available for bonding assuming other factors to be equal. The result of the present study indicates that teeth restored with posterior composite P-60 after application of enamel and dentin universal bonding adhesive enhances the fracture resistance of the tooth and brings back the strength of endodontically treated tooth to that of an intact tooth without the use of post systems, in a controlled environmental laboratory study and clinical testing is required before a tooth adhesive composite postendodontic care along circumventing a post system can be recommended for increasing the fracture resistance in a pulpless teeth. Glass ionomer cement (Fuji 9) when used as a core material gave the least values with regard to fracture resistance in endodontically treated teeth. The glass ionomer and silver alloy cement (Hi-Dense) was found to be the second best core material in this study. The use of posterior composite P-60 with enamel and dentin universal bonding agent gives the maximum strengthening effect in endodontically treated premolars and were as strong as normal tooth. 1. Fahl N Jr. Achieving ultimate anterior esthetics with a new microhybrid composite C.C.E. Dent Suppl 2000;26:4-13. 2. Khera SC, Carpenter CW, Vetter JD, Staley RN. Anatomy of cusps of posterior teeth and their fracture potential. J Prosthet Dent 1990;64:139-47. 3. Burke FJ. Tooth fracture in vivo and in vitro. J Dent 1992;20:131-9. 4. Trope M, Tronstad L. Resistance to fracture of endodontically treated premolars restored with glass ionomer cement or acid etch composite resin. J Endod 1991;17:257-9. 5. Joynt RB, Wieczkowski G Jr, Klockwski R, Danis EL. Effects of composite restorations on resistance to cuspal fracture in posterior teeth. J Prosthet Dent 1987;57:431-5. 6. Edward J. Swift An update on glass ionomer cements. Quint Inter 1988;19:125-30. 7. Jyont RB, Danis EL, Wieczkowski G, Williams DA. Fracture resistance of posterior teeth restored with glass ionomer - composite resin systems. J Prosthet Dent 1989;62:28-31. 8. Stewart GG. Clinical application of glass ionomer cements in endodontics: Case reports. Int Endod J 1990;23:172-8. 9. de Gee AJ, van Duinen RN, Werner A, Davidson CL. Early and long term wear of conventional and resin-modified glass ionomers. J Dent Res 1996;75:1613-15/619. 10. Jagdish S, Yogesh BG. Fracture resistance of teeth with class 2 silver amalgam, posterior composite and glass cement restorations. Oper Dent 1990;15:42-7.